As a mom myself, I understand the struggle for that much needed, sanity-saving alone time that moms crave (and usually don’t get enough of). It’s very difficult for me to get to the gym sometimes because I plan my workouts around my husband’s work schedule. 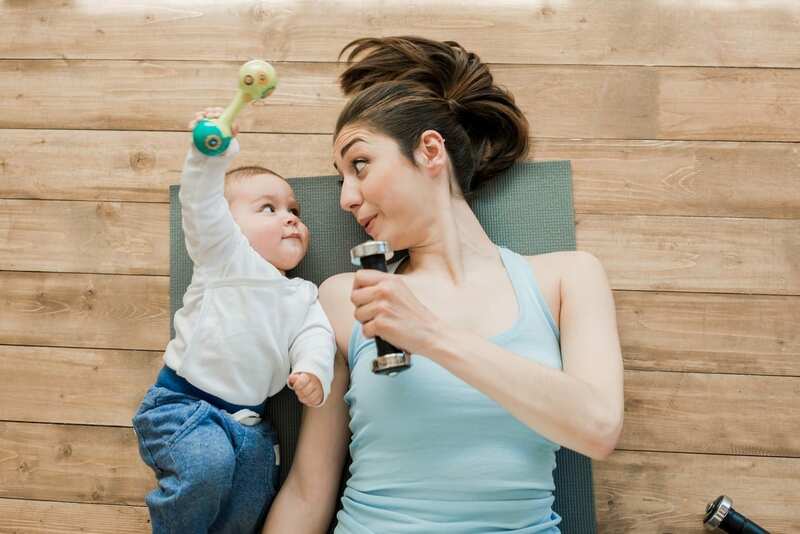 Although it can be a workout just to find time to get out of the house regularly and get to my local gym, I still do it because I feel that when I am regularly working out, getting that much needed exercise (and alone time), I am a better mom. I am better able to focus on my children and care for them more thoroughly when I am feeling strong, fit and healthy. My daughter just turned two, and has endless energy! She rarely naps wakes early and goes to sleep late and while she is awake she is full throttle ready to play, discover and learn everything she can cram into the day before falling asleep. This requires me to also have endless energy and I feel that the days when I squeeze a workout in, I am much more easily able to keep up with her, and am not as groggy as normal. Zumba, spinning, and yoga make up my workout routines, and are my favorite classes to take. I love that they are only 45 minutes to an hour long, which is perfect for my tight schedule and they are teacher led and motivated. I really enjoy being able to have that hour to sweat it out and I feel rejuvenated afterward. Zumba is a Latin dance class, and that makes working out fun! It honestly doesn’t even feel like I’m working most classes. Yoga renews my mind and muscles. It is a slower paced class, and lets me really relax and focus on me for one whole hour! I usually opt for a spinning class if I want a harder, more strenuous workout. Spin class is also only 45 minutes long, so if I need to be quick this class is always a great option! I also frequently add in a sauna session. I love that my gym has a hot sauna and I usually recover from my workouts with a 15-20 minute sauna session. This helps to relax my muscles, and gives me a little down time before heading home. I usually stretch while I am in there as well; it is a great way to wind down your workout in a warm environment. It also continues to burn calories, which is a nice bonus! It can be very difficult to keep a gym schedule. This is what I struggle with the most! I find that writing out the days that I want to head to the gym on our family calendar help me to be more accountable. Being able to cross it off the calendar motivates me to try extra hard to get to the gym and also is a great visual that I can look at and see what days I went and how frequently I attended classes that month. Keeping track help me to keep on track despite the birthday parties, doctor appointments, and other events that cause my schedule to frequently fluctuate. There are also the days when I am just so exhausted that I skip my workouts. This is a paradox, because by skipping classes I continue to feel tired and groggy, but the days I power through and force myself to head to the gym, I actually feel less tired, and more capable of finishing out the day strong, and more rejuvenated. Overall I feel that when I am feeling strong and fit I can be a better mom. Making time to take care of myself physically is important to me, but also makes me feel much better mentally as well. Moms often feel run down, and worn out after taking care of their kids, homes, and even spouses day in and day out. By taking even just an hour to yourself to do something you enjoy, and something that gets you moving can rejuvenate you and help you to be able to focus on your kids, and be able to care for them, and meet their needs without feeling as drained and worn out as you used to.